At the beginning of the Latène Age, around the year 500 B.C., a wholly new style of art evolved within the Celtic tribes of Central Europe, going far beyond the existing one. This "new" style is expressed in a multitude of unique ornaments and motifs, which are not only found on the jewellery and the especially valuable weapons of the ruling upper class but were used on everyday objects as well. The style that emerged in that era is described as "Celtic style" in art history, borne by independent masterpieces and iconography, which were quite obviously inspired by themes from Celtic mythology. The Hunsrück-Eifel region played a markedly progressive role here. Among experts, there is even mention of the "Hunsrück-Eifel culture", which underscores the cultural significance of the region at that time. The aesthetically persuasive, generally very valuable works of art, as well as the finely worked gold-smithery from the elite graves, also demonstrate the economic prosperity of the Hunsrück-Eifel region during this era. An example of this is the "princely tomb" near the village of Schwarzenbach (Hunsrück) with art objects in the early Celtic style, from the years 450-375 B.C., or the grave of the "Princess" from Waldalgesheim (Nahe Valley) with unique pieces of jewellery from around 325 B.C. in tendril style. No later than the introduction of Celtic coin minting in the 3rd century B.C., one can speak of the first high civilization of western and central Europe, which flourished for over 200 years. With it evolved a wide-ranging cultural federation, in which it seems likely, a unique group of related languages was disseminated. After Caesar conquered the Gauls (58-51 B.C. ), a large part of Europe was united for almost 500 years as the Roman Imperium under the "Pax Romana" (Roman peace). The civil and cultural influence of Rome, with its advanced technology and its appreciation for of art and education, had a lasting effect on the Nahe-Hunsrück region. The speed with which this Romanization process took place soon after Caesar's victory can be seen, for example, in the grave fields of the Celtic Treverians in Hunsrück. The newly established Roman towns and villages strongly precipitated this process. 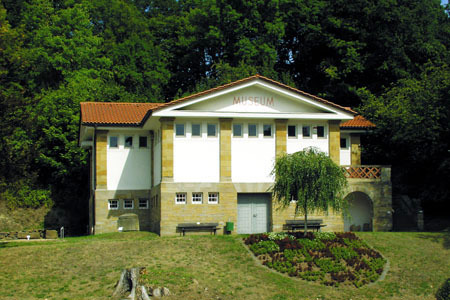 In the year 1910 the Birkenfeld Museum was dedicated by the society for "palaeontology in the Principality of Birkenfeld", who have made it their business to systemize the evidence of the Celtic and Roman past along with objects that document the more recent history of the region and to make this accessible to the wider public. The pre- and early-historical collection in the museum can primarily be traced back to finds from different excavations by the society, which were regularly carried out in the second half of the 19th century. It is not surprising then that the appearance of the first Birkenfeld catalogue in the year 1914 attracted great attention across the region. The museum has undergone considerable expansion in the past decade with the establishment of a section devoted to local studies and folklore that is worth seeing. This new addition has also meant a positive shift of emphasis for the museum, particularly since highly specialised teams are now responsible for the treatment of archaeological finds and the execution of archaeological excavations. A visit to the Birkenfeld Museum is a must for anyone interested in more than just the "here and now". A must as our far-reaching history is highlighted and because literature suggests that there is not a single thought that hasn't be thought by others long before us. Would you like to take a quick look at the museum?